Thank you for inviting me to review your production and for the kind welcome and hospitality from FRANKIE HOGAN and the front of house team, which was co-ordinated by ESTELLE DELL. 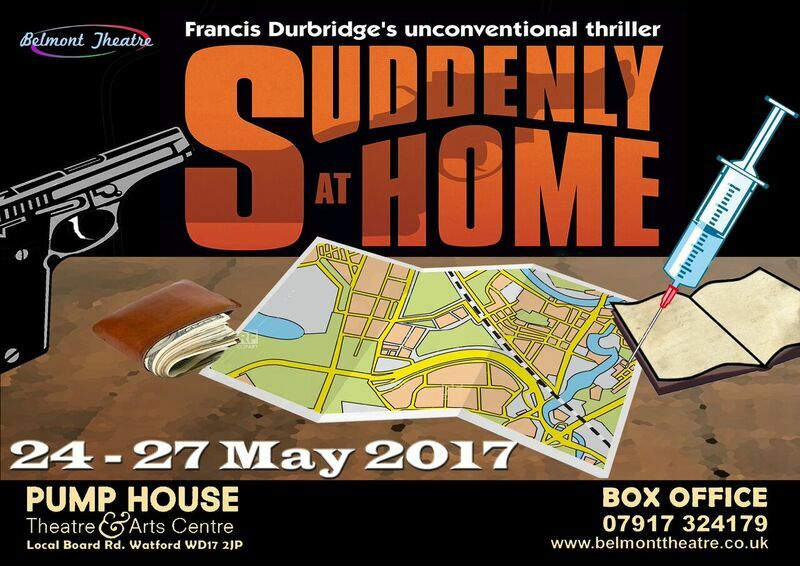 ‘Suddenly At Home’ is a murder mystery with a difference. Early on we see the murder taking place before our very eyes and therefore know ‘who dunnit’. The mystery is whether or not the murderer will get away with it. We are used to plays of a high standard from Belmont and this production, set in the 1970’s, did not disappoint. The curtains opened to yet another beautifully presented set. Well done to set designers PAUL BOTLEY and BILL REBELLO with construction by MARK DREELAN and members of the company. Directors GRAHAM BRODERICK and PAUL BOTLEY had put together a well flowing piece of gripping storytelling, with each character playing their part to keep us in suspense. The action moved along at a good pace to maintain the interest of the audience throughout. The actual ‘murder’ was extremely well directed with lots of complicated business especially with the handling of the ‘body’. For a first attempts at directing, Graham, you did very well and I hope you enjoyed the process as much as the audience enjoyed your production. Properties and furniture were well sourced by HELEN SHERWOOD and ELLEN MOYES with special props by LES SUTHERLAND. All were in keeping with the period and for a number of us in the audience there were some nostalgic moments as we recognised items from our youth in the 1970’s. All changes were carried out smoothly and efficiently by the team, stage managed by LORNA ALDER. Lighting and sound by EDDIE STEPHENS, KIM RODGER and HELENE SMITH really enhanced the production. The mysterious, eerie music at the beginning and during the changes set the scene, getting the audience in the mood for what was to come. However, there was a moment in Act 2 when music over dialogue was a little too loud so that we struggled to hear what the actors were saying. Also, the doorbell and slamming of the front door offstage were rather too loud to be natural. A small point but something that can be easily remedied. Because of the layout of the Pump House stage and auditorium, this is always a problem for all the companies that perform here so it is worth spending a little extra time sound checking at get-in. Lighting filled the stage with no shadowed corners enabling us to see the actors at all times, even during moments of low ‘mood’ lighting. I am always pleased to leave a performance without remembering too much about the lighting as this means it has been natural and well executed, enhancing the actors’ performances, not drawing attention from them. Wardrobe by ANNE SUTHERLAND was exactly right for the 1970’s and for each character. For those of us who remember this decade well, it was a trip down memory lane. The programme was well laid out and informative. The posters were eye-catching and in keeping with the subject matter. Both were well designed by MIKE and MAGGIE MORROW with photography by ALICE BREZINSKA. What a fun role to play, so competently performed by this seasoned and experienced actor. The intricacies of the dialogue flowed with ease and all the business when alone on the stage was slick and kept the audience enthralled. The plotting and then the carrying out of the actual murder, then dealing with the body, was handled so efficiently and naturally, to be totally believable. I was particularly impressed with the contrast between the confidence before the murder and the unease as things begin to unravel after the murder. I certainly forgave the moment when Michael called Helen Sheila and then muddled everyone’s names on opening night, as I am sure the character would have done the same at that point under such pressure! This was a good, confident performance and no-one in the audience would be able to tell that this was Natasha’s first performance as an adult if they had not read the programme. Dialogue was delivered in a natural manner, although, to begin with it was a little rushed and I did miss some of what was being said. However, that is understandably due to opening night nerves and Natasha did settle into a more measured delivery as the action progressed. What a peach of a role, flamboyant and, as Dawn herself said, larger than life. Dawn threw herself with gusto into her performance. Projection and diction were good with nice facial expressions. As the murder victim Dawn is to be commended on her handling of the actual murder scene and the subsequent length of time being left on stage as the body, remaining completely still, even when being man-handled by the murderer, until she could finally leave the stage. This is quite a tricky role as Sheila is in on the plot and has a part to play providing an alibi, but she is uncomfortable with the situation and worried that something will go wrong. Tara successfully gave us a ‘nervy’ performance leaving us in no doubt as to Sheila’s unease, especially when things don’t go to plan. Tara articulated clearly and moved well around the stage, interacting well with the other characters. An effortless performance from this experienced performer. Good delivery of dialogue throughout. There was a convincing change of character from the happy-go-lucky author of saucy books to the fearful murder suspect, who realised he is being set up and likely to be accused of committing the crime. Nice interaction with the other characters. Although a small role, Durba did well in her debut performance for Belmont. Be careful Durba, not to rush your dialogue when you are nervous – the opening dialogue was a little difficult to understand on opening night but once you had steadied your nerves every word could be understood. Good facial expression and natural movement around the stage. Although small roles that do not appear until much later in the play, both are extremely important to the plot and the final ending. Steve and Mike played their parts well with solid characterisation and well-handled interaction with the other characters. I do love a murder mystery and really enjoyed this production.